These Breakfast Calzones are such a fun and easy delicious breakfast! They are perfect for feeding a whole mess of kids! Thank you Jennie-O for sponsoring and inspiring this post! At what point do you call it quits on a book? So, I have this thing where I find it so difficult to give up on a book, especially if it is by an author that I’ve previously loved. I keep wanting to hold out hope that a book is going to get better . . . and I just end up not reading it, or really anything. So at what point do you call it quits? I think it’s because I hate all the characters. Like there is literally no one that I’m cheering for. They are all kind of miserable souls. What if that is the point of the book and I’m just not smart enough to get that? But I just want to be done with it already! I want to read something where I care about the characters and want them to not fall off a cliff. You know? . . . . Book suggestions? So, what is not questionable or in need of a replacement? This breakfast! 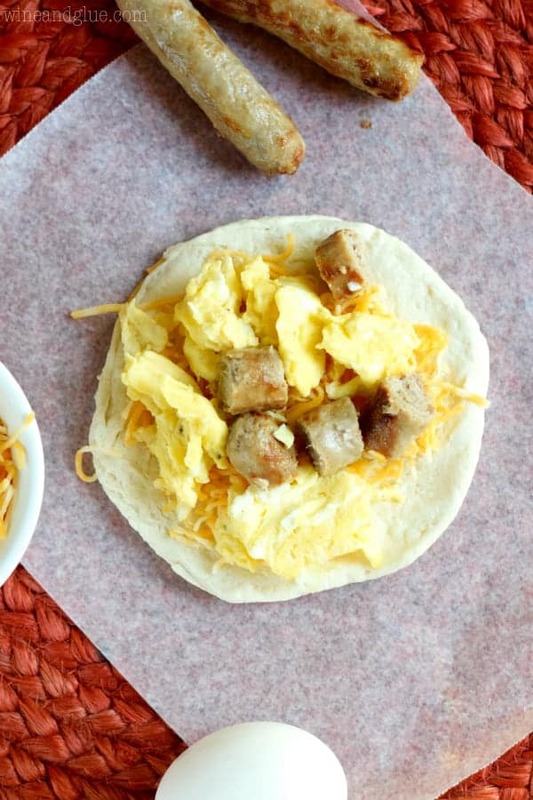 These Breakfast Calzones are made with Jennie-O’s Lean Turkey Breakfast Sausage Links. 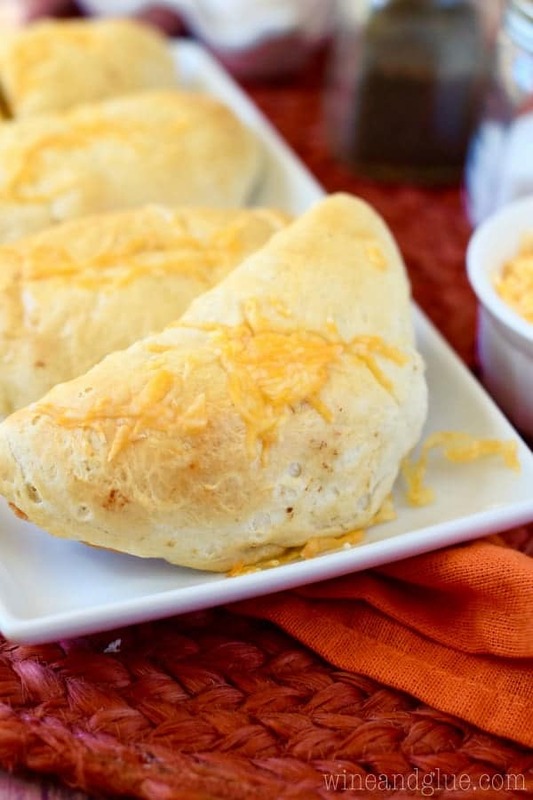 They are absolutely delicious on their own, and they add a ton of flavor to these breakfast calzones! 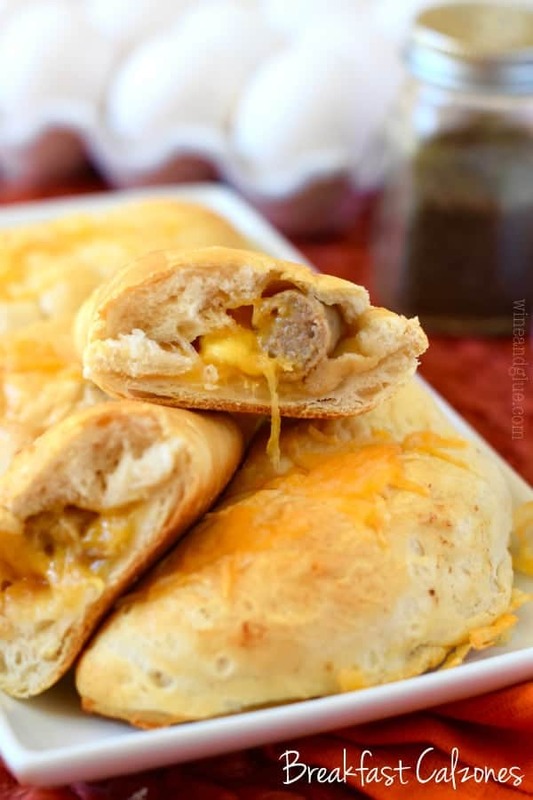 These calzones would be perfect for a weekday breakfast, because you just cook the sausages in about 10 minutes, scramble some eggs, and then hand your kiddos calzones as they run out the door. They’d also make a great afternoon snack! 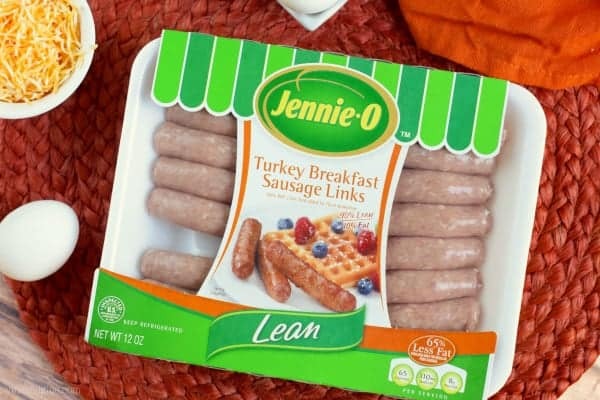 Make sure you follow Jennie-O on Instagram, Twitter, and Pinterest and check out their site for more great breakfast ideas! Cook the turkey links according to directions. Scramble the eggs with a splash of milk and a little salt and pepper and cook until done. Fold over the biscuit, and pinch it together. Brush the biscuits with a little bit of egg whites. Bake on parchment paper or a silicon lined baking sheet for 14 to 16 minutes or until golden. 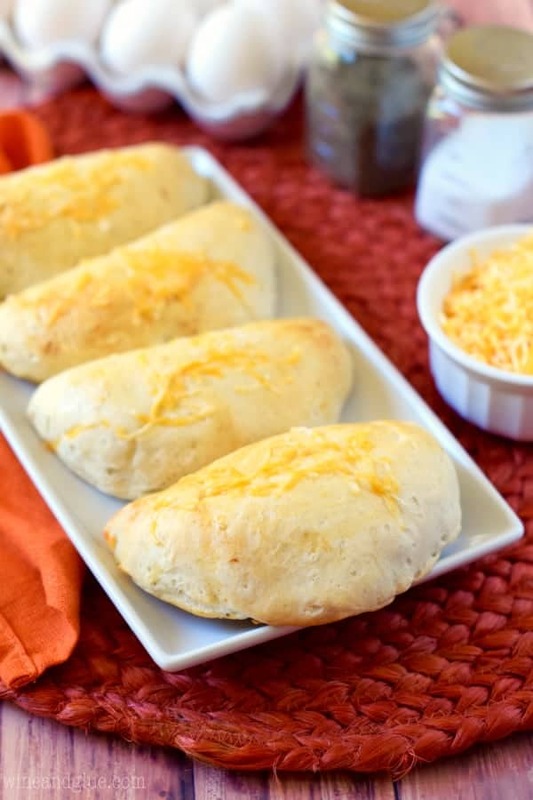 Add a small amount of shredded cheese to the top of the calzones for the last two minutes of baking. Lisa, give up on the book. You’ve given it more than a fair shot. Why take precious reading time and use it on a book you’re not into? Approach reading like dating. No time wasting! BTW, I finished Gone Girl recently. If you haven’t read it, I recommend. It was really good. These look like a fantastically decadent breakfast. I’m on board! Oh gosh, for me…if the book doesn’t grab me within the first chapter, I’m out! How bad is that? What’s not bad is these calzones. I made something similar just last week, but I like these better! LOVE Jennie-O. Man. I SHOULD ditch it. But now I want to know what happens! Maybe I should just google it, HAHAHAHA! That’s exactly how I felt about a certain book that was made into a really big movie where the wife was kidnapped and the husband was accused. Everyone said the book was amazing. I just couldn’t get through it. I gave up about 1/2 way through. I just couldn’t do it anymore. These calzonez on the other hand, look great and I can’t wait to make them! I would love to make these and freeze and microwave for my working men. Has anyone tried this? How many calzones does this make? I’m looking to feed 6-7 people and adding apple slices as a side. Do I need to double this recipe? You could get about a calzone a person with this recipe. And it just depends on how your guests eat. 7 teenage boys? Double it. 7 teenage girls, probably not. If you’re making a bunch of these (like 20 or so), could you make ahead of time and just pop into the oven the morning of? Or would that ruin the eggs, filling, etc.? So, to be honest, I wouldn’t. I love the Pillsbury rolls for their convenience, but really, they are so much better fresh out of the package. I would say make the eggs and bacon ahead of time and then assemble and bake int he morning. The assembling really doesn’t take long. These look great! Try the Outlander series, you will definitely LOVE the characters! I’m with Dawn.. if you haven’t read the Outlander series, you should. You will become totally invested in the characters. I also enjoy the In Death series by JD Robb. J D Robb is my favorite series. But read them in order. When I read a book I can’t get into I finally jump to the end then discard. Don’t waste time when there are plenty more authors to read. These are great and quick. This looks scrumptious! As for Books, if you like romance with a bit of magic, Janet Chapman! She has a whole series out and you don’t have to wait! Delicious recipe, book suggestion, ‘The Goldfinch”. I so relate (about the book). I’ve had a few of those… stop. Maybe the next one by this author will captivate you (that has happened, too). I like that you-know-who allows free sample downloads… it allows me to see if I”m interested prior to purchasing… it is a great way to check out new authors (and long-time friends with new material). I think as long as you froze right away it would be okay. Pillsbury dough isn’t awesome after it’s been out for a while. And yes! I need to do more of the previewing! Huge hit at a breakfast potluck this morning. I added a white gravy sauce on the side for our guys to dip these amazing breakfast bites into. Perfect way for everyone to start off this snowy morning. That gravy tip is genius, thanks Tabitha! You want to read a book series that you both love and hate the main character? The Chronicles of Thomas Covenant the Unbeliever by Stephen Donaldson. I read them as a child (I read at high school level by 3rd grade thanks to my Grandmother) They belonged to one of my older brothers and I have read them several times as an adult, they are that good!! I still have trouble putting them down while I read them and feel sad when I finish them.